It was Vandana Katariya who gave India the lead in the 48th minute but the visitors' joy was cut short when South Korea's Bomi Kim (50') scored the equaliser two minutes later. 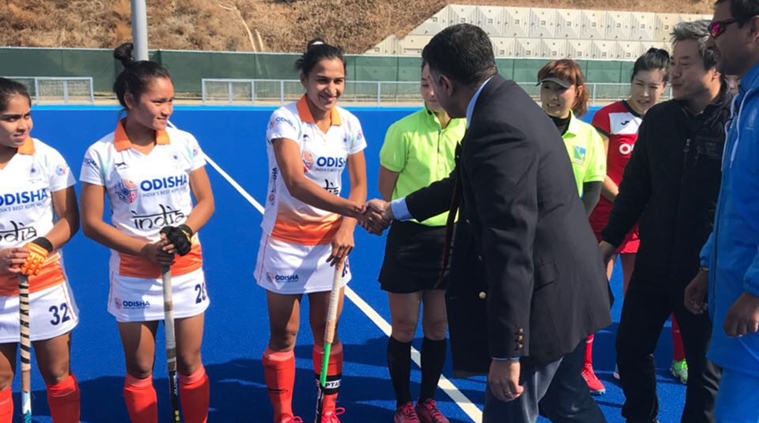 Indian women’s hockey team played out a 1-1 draw against hosts South Korea in the last game to win the five-match series 3-1 in Seoul on Sunday. Both the teams scored a goal each in the final quarter of the match to share the honours. It was Vandana Katariya who gave India the lead in the 48th minute but the visitors’ joy was cut short when South Korea’s Bomi Kim (50′) scored the equaliser two minutes later. The first quarter was keenly fought as both the teams adopted a patient approach to build their attacks. Players from both the teams defended well as a unit but failed to produce much going forward in the final third of the pitch. The lack of attacking intent from either side in the opening 15 minutes saw the scoreline remain 0-0 at the end of the quarter. The second quarter saw the hosts create better chances going forward and the world no. 9 side made some attacking forays into the Indian striking circle. South Korean forwards earned themselves two penalty corners in the second quarter but Indian goalkeeper Rajani Etimarpu was up to the task as she made two great reflex saves to deny the hosts. The Indians came out rejuvenated after half-time and focused on quick and precise passing. It took India 41st minutes to earn its first penalty corner but South Korea’s Mijin Han made a good save as the deadlock continued. In the last quarter, both the teams looked to finish off the series on a good note and created more chances. It was India who benefited first when Vandana shot in a a well-waited forward pass from skipper Rani Rampal in the 48th minute. However, the lead was short-lived as South Korea scored a field goal in the 50th minute through Bomi Kim to draw parity. In the last 10 minutes both the teams attacked in search of the winner but in vain.